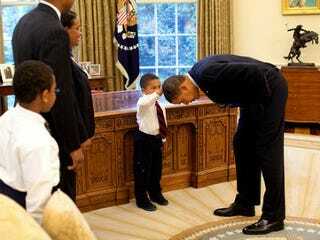 A 2009 photograph of President Obama bending over so a 5-year-old African American boy can touch his hair is enjoying renewed popularity after reporter Jackie Calmes recounted the story behind the image last week in the New York Times. On the day it ran, Dylan Stableford reported for Yahoo News, it was most-emailed article on the Times' website. Calmes' piece began, "For decades at the White House, photographs of the president at work and at play have hung throughout the West Wing, and each print soon gives way to a more recent shot. But one picture of President Obama remains after three years. "In the photo, Mr. Obama looks to be bowing to a sharply dressed 5-year-old black boy, who stands erect beside the Oval Office desk, his arm raised to touch the president's hair — to see if it feels like his. The image has struck so many White House aides and visitors that by popular demand it stays put while others come and go." Leutisha Stills, writing as "rikyrah" on the Jack & Jill Politics blog, reprinted the Calmes piece and declared, "I consider this to still be THE picture of Barack Obama's Presidency." Washington Post editorial writer Jonathan Capehart wrote, "The first time I saw it was while walking through the West Wing to a meeting three years ago. "The image was so powerful I stopped in my tracks . . .
". . . Thanks to the legacy of slavery and Jim Crow, we African Americans are sensitive about our heads and our hair. A pat on the head, especially from someone white, would be patronizing at best. 'Don't let anybody touch your head,' my mother told me when we moved from Newark to a predominantly white town in New Jersey. I would learn at school that some would rub the head of someone black for good luck. And there were all sorts of put-downs for black hair — from Brillo to something not appropriate to mention in a family forum such as this. Thus, having your head touched is a rather intimate gesture that only family could get away with." In the New York Times, Frank Bruni wrote on Sunday, "Forget your political affiliation. Never mind your assessment of his time in office so far. If you have any kind of heart, you're struck by it: the photograph of Barack Obama bent down so that a young black boy can touch his head and see if the president's hair is indeed like his own. It moves you. It also speaks to a way in which Obama and Mitt Romney, whose campaigns are picking up the pace just as polls show them neck and neck, are profoundly mismatched." Jonathan Jones wrote Friday for Britain's Guardian newspaper, "Spontaneous or staged this photograph tells a truth. All over America, all over the world, children are growing up in the simple knowledge of who this president is. It matters. Obama is a great historical fact — touch it, dude," Jones wrote, echoing Obama's command to the young boy. Pete Souza, a former photographer for the Chicago Tribune as well as the Reagan White House, told Calmes, "As a photographer, you know when you have a unique moment. But I didn't realize the extent to which this one would take on a life of its own. . . ."
"David Axelrod, Mr. Obama's longtime adviser, has a copy framed in his Chicago office," Calmes continued. Axelrod said of the young boy, Jacob Philadelphia, "Really, what he was saying is, 'Gee, you're just like me.' And it doesn't take a big leap to think that child could be thinking, 'Maybe I could be here someday.' This can be such a cynical business, and then there are moments like that that just remind you that it's worth it." Adrienne LaFrance, Nieman Journalism Lab: Obama directive means federal agencies have to go mobile — can newsrooms keep up? Gary Younge, the Guardian, Britain: Why do poor white voters reject the Democrats? Well, why shouldn't they? "Thirty years ago, at the height of the civil war in Guatemala, a group of government soldiers led an assault on the northern village of Dos Erres, massacring more than 250 men, women, and children," David Abel reported for the Boston Globe. "They left just two survivors: two light-skinned, green-eyed young boys. "Last year, more than a decade after he moved to Framingham to seek work, Oscar Alfredo Ramírez Castañeda received a call from his hometown in Guatemala that would change his life. "The 32-year-old father of four learned that he was one of those two survivors, and that he had been kidnapped and raised by the family of one of the commanders who led the raid on Dos Erres. "He also learned that there was another survivor who happened to be away from the village on that bloody day in 1982: his father. "The slaughter in Dos Erres was one of 600 mass killings in a 36-year-long war that left more than 200,000 people dead. "The story, a version of which also aired this weekend on the radio program 'This American Life,' recounts how Ramírez Castañeda is coming to terms with his true identity." "This American Life" noted: "This story was co-reported with Sebastian Rotella of ProPublica, Ana Arana of Fundación MEPI, independent journalist Habiba Nosheen and This American Life producer Brian Reed. Their essay 'Finding Oscar,' which is accompanied by a timeline, slideshow and character guide, can be read at propublica.org and is also available as an eBook. Annie Correal helped with research and translations." "Individual meetings with Times-Picayune employees, at which they will learn whether they have lost their jobs or will be offered new positions with the new NOLA Media Group, are set to begin in about a week — probably starting Monday, June 4 or Tuesday, June 5, according to sources with knowledge of Advance Publications' plans," Kevin Allman reported Sunday for Gambit, an alternative newspaper in New Orleans. "Many newsroom employees spent their Memorial Day weekend updating resumes, obtaining copies of their clips, networking by telephone and social media and following job leads in New Orleans and elsewhere. "At the meetings, Advance, which owns The Times-Picayune, will reportedly offer severance packages to some employees, while tendering job offers to others. Job descriptions will likely be revised, and those who receive offers to stay will likely have to reapply for the new positions within the newly created NOLA Media Group." ". . . If you've spent much time consuming conservative media lately, you've probably learned about a slow-burning 'race war' going on in America today," McKay Coppins reported last week for BuzzFeed. "Sewing together disparate data points and compelling anecdotes . . . conservative bloggers and opinion-makers are driving the narrative with increasing frequency. Their message: Black-on-white violence is spiking — and the mainstream media is trying to cover it up. "This notion isn't necessarily new to the right, which has long complained about stifling political correctness in the media and the rising tide of 'reverse racism.' But the race war narrative has gained renewed traction during the Obama years, as various factors — from liberals' efforts to paint the Tea Party as racist, to the widely-covered Trayvon Martin shooting — have left conservatives feeling unfairly maligned, and combative. ". . . The conservative media's in-your-face reporting of black-on-white crime is a sort of demonstration project — a rebellious response to decades of fielding charges of racism from the cultural elites who run the mainstream press. . . ."
Jamal Eric Watson, a former executive editor of the New York Amsterdam News, has resigned as an assistant professor of English at Mercer County Community College in New Jersey, the college president told Journal-isms on Friday. The Mercer County prosecutor's office had taken over an inquiry related to Watson, the Times of Trenton, N.J., reported in March. But the Times also reported then, "Neither the college nor law enforcement officials will say exactly what allegations have been levied against Watson." Dr. Patricia C. Donohue, the college president, said in a statement to Journal-isms, "Mr. Eric Watson has resigned from Mercer County Community College as of May 18, 2012. The investigation has ended." Watson told Journal-isms by telephone that he did not consider that he had resigned. "I did not have tenure. I was on a year by year" contract. "You serve at the pleasure of the college. My contract ended in May." Asked what he planned to do next, Watson said, "The same thing I've been doing for the last seven years," apparently a reference to his freelance work. In 2006, Watson pleaded guilty to a felony charge of third-degree grand larceny after being accused of cashing checks made out to Amsterdam News summer interns. ABC News has announced a new fellowship program "to attract and develop aspiring journalists from diverse backgrounds for a rigorous and rewarding year-long opportunity," Michelle Levi wrote Thursday for ABC News. "Starting this July, future news leaders will rotate through several ABC News departments and broadcasts while mastering editorial, production, and newsgathering skills. Participants from a variety of racial, ethnic, socio-economic and geographic backgrounds will work closely with an experienced ABC News mentor." ABC News is accepting applications for a July 2 start date. As a question for Asian Pacific American Heritage Month, Les Suzukamo, a business reporter covering technology, energy and local media for the Pioneer Press in St. Paul, Minn., was asked, "What do you love most about being Asian American?" "As an Asian far from the coasts, I have often felt conspicuous here in Minnesota. You can't hide, but that was a good thing for a shy person like me. It forced me to grow and establish myself and to help define the idea of what is 'Asian.' The outsider status that Asians have long held on the mainland actually helped prepare me for journalism, where we journalists are usually outsiders looking in." A Q-and-A with Suzukamo was the May 17 entry among AAJA's profiles for the heritage month. Suzukamo was a founding member of AAJA's Minnesota chapter. MSNBC anchor Tamron Hall told ebony.com that she is among journalists who have a responsibility to educate younger black women about the negative aspects of hip-hop. "This notion that you can have everything you want if you can drop it low enough and the objectification that we're seeing I believe adds to low self-esteem in women which can sometimes contribute to domestic abuse. Then some women find themselves in situations where they are too afraid to leave or unable to find support. "We are presented with a unique situation in the Black community in that we have embraced the beauty of hip hop, the real rawness of it, the real fun of it, but we also have to address the damage it has done. We have to look at what it's done to our black girls, especially when it comes to domestic violence." Public Radio International has made available a weeklong series on the role of class around the world that can be accessed via its website. "This series of stories explores these issues through the eyes of a disparate group of individuals: a bank employee in Egypt, a TV producer in Ukraine, an Indian scientist in New Jersey, a farmer in China, a former mineworker in Britain," the network says. "The Grouchy Gourmet," a weekly column, "first appeared in my weekly newspaper Indian Country Today in the late 1980s," Tim Giago wrote Monday for indianz.com. "It came about because the newspaper had received several calls and letters from Native American readers explaining how shabbily they were treated in some of the local eating establishments. . . . a weekly [column] dreamed up because of racial prejudice, not only led to better service and treatment of Native Americans, but it also opened up job opportunities for them." "CBS has scheduled its next interfaith special, a documentary on AIDS awareness within religious communities, for next month," Merrill Knox reported Sunday for TVNewser. " 'HIV & AIDS: Awareness & Compassion,' examines the small but growing movements within several different religious organizations to fight the stigma of living with the disease." planned at the Post building on Tuesday evening, June 26. Proceeds go to BabySteps, a not-for-profit organization that Raspberry founded in his hometown of Okolona, Miss., to teach parents of mostly low-income preschoolers how to help their children succeed in school and in life. Raspberry, 76, wrote a column for the Post from 1966 to 2005 and won the Pulitzer Prize for commentary in 1994. For more information about the roast/benefit, email raspberrybenefit (at) verizon.net. Actress Eva Longoria of television's "Desperate Housewives" "actually tried to defend a series she had agreed to co-produce about Latinas cast as housekeepers," Ruben Navarrette Jr. wrote in his column Sunday for the Washington Post Writers Group. ". . . Fortunately, in a burst of good taste and common sense, ABC decided not to pick up the series." Meanwhile, Janet Murguía, president and CEO of the National Council of La Raza, wrote for the Huffington Post Wednesday, "The shows that most Americans watch at night are a serious contrast to our schools, our neighborhoods, and our communities — devoid of a significant minority presence, especially when it comes to Latinos. And the fall TV schedule unveiled last week in New York by the four major networks does little to change that monochromatic landscape, and perhaps will make it even worse." "On May 8, freelance reporter Banning Eyre reviewed the new album by a Brooklyn-based band inspired by Peruvian music called Chicha Libre," NPR ombudsman Edward Schumacher-Matos wrote Friday. "It's easy to imagine that this music was made by lowlife Peruvian musicians in the '60s, tipsy on chicha wine and surf guitar," he said on air. Eyre agreed that "Lowlife was a poor choice of words." Political blogger Faye Anderson "is developing a web-based Cost of Freedom app, a one-stop site for voter ID information in all 50 states and the District of Columbia," Annette John-Hall wrote Friday in the Philadelphia Inquirer. "Cost of Freedom not only will give voters the information they need to cast their ballots, but will show them how to get it." The International Press Institute said Thursday it was "concerned by news reports that journalists attempting to photograph a visit by supermodel Naomi Campbell to the Church of the Nativity in Bethlehem were 'harassed' by Palestinian security forces." Conservative writer Dinesh D'Souza drew criticism in 2010 with a Forbes cover story that accused President Obama of adopting the cause of anti-colonialism from his Kenyan father. Now "The Roots of Obama's Rage," the book upon which that piece was loosely based, is being made into a documentary film, Jim Rutenberg and Jeff Zeleny reported Friday in the New York Times. The film is partially financed by billionaire investor Joe Ricketts, who previously considered financing a multimillion dollar political ad campaign linking Obama to his former pastor, the Rev. Jeremiah Wright. The blowback from the Wright idea "has imperiled the Rickettses' hopes for subsidies from Chicago's amusement tax and other largess from the city," Laura Washington wrote in the Chicago Sun-Times. The Ricketts family owns the Chicago Cubs baseball team. Curators at the Chicago History Museum are combing through the collection of Eunice W. Johnson, the creator of the Ebony Fashion Fair and co-founder of the Johnson Publishing Co. who died in 2010, to create a March 2013 exhibition. Christina Binkley reported for the Wall Street Journal on Wednesday, "Mrs. Johnson didn't shy from cutting-edge fashion, and the trove includes dramatic Pierre Cardin and Emilio Pucci designs from the 1960s and 1970s. There is also a well-known 'Picasso' dress from Yves Saint Laurent, a gown designed by Alexander McQueen during his brief stint as Givenchy's creative director and two Paco Rabanne hot-pant ensembles made of plastic discs." Marcus Vanderberg of MediaBistro Wednesday asked freelancer Lola Ogunnaike, formerly of the New York Times and CNN, "How much pitching do you do these days, and what's the key to building great relationships with editors?" Ogunnaike replied, "I don't have to pitch nearly as much as I used to when I was young, because I’ve managed to cultivate some strong relationships with editors along with television producers. I think one of the key things is to make sure they know who you are. That can be as simple as asking them out for coffee or tea or asking them out to dinner and offering to pay for both of those things, which is very important. But it's also just following up with a link to a story that you may have written. . . . " Ogunnaike called the New York Association of Black Journalists' recent award to Beyonce for an Essence magazine essay "an obvious publicity stunt." "Police in Ethiopia today detained Peter Heinlein, a correspondent for the U.S. government-funded broadcaster Voice of America, along with Simegnish Yekoye, a freelance reporter and Heinlein's interpreter, according to Jennifer Janin, the Africa coverage editor for VOA, and local journalists," the Committee to Protect Journalists reported Friday. "Heinlein and Simegnish were detained while covering a demonstration of Muslims protesting alleged government interference in religious affairs, Janin said." A wake for black radio pioneer Hal Jackson, who died last week at 96, is scheduled in New York on Wednesday from 2 p.m. to 5 p.m. and from 7 p.m. to 9 p.m. It will be held at the Frank Campbell Funeral Home, Madison Avenue and 81st Street, Jerry Barmash reported Friday for FishbowlNY. The funeral is Thursday at 11 a.m. at the Riverside Church, 490 Riverside Drive and 121st Street. In lieu of flowers, the family requests donations made to Hal Jackson's Talented Teens International/Youth Development Foundation, 1230 Park Ave., PH-A, New York, N.Y.
"Jeffrey Gettleman, the Pulitzer Prize-winning New York Times correspondent, says he travels with 'a small militia' whenever he reports from Somalia, the East African country afflicted by armed insurgency, poverty, and hunger," Nicole Schilit wrote for the Committee to Protect Journalists. "As intrusive as the security detail might be, he feels far more fortunate than the local reporters who face sustained and often deadly risks, or the freelance journalists who don't have the extensive support system the Times can provide. Gettleman spoke to a crowd of about 100 at the Half King pub in Manhattan on Tuesday in the first event in the new CPJ discussion series, 'CPJ Debrief.' "